Three pieces of Khmer sculpture are on loan to the National Gallery of Australia in Canberra from the National Museum of Cambodia. Readers in Canberra may be interested in the new exhibition at the National Gallery of Australia, Life, Death and Magic: 2000 Years of Southeast Asian Ancestral Art. 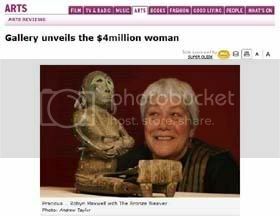 26 October 2006 (Sydney Morning Herald) – The National Gallery of Australia reveals its latest item in its collection, a 6th century bronze statuette of Indonesian origin. The article doesn’t describe the statuette’s provenance, but mentions that it was from the Javanese bronze age. This would put it around the time of the Srivijaya empire, although there is mention of an independent Bronze Age. Will have to go read that up. The diminutive sculpture depicts a woman nursing an infant while weaving on a foot-braced body tension loom. Part of the myth surrounding the sculpture is the uncertainty about its age. It was believed to be too young to come from the Dong Son bronze-age culture that was centred on North Vietnam and ended in AD200, and it may have been from the Javanese Bronze Age, which peaked between the eighth and 14th centuries. The gallery decided to have the clay core of the sculpture tested by thermo-luminescence. The surprise result was that it was made between AD556 and 596. Maxwell says archaeologists suggested there was an independent island bronze age in Indonesia about that time and there are several pieces in the National Gallery in Jakarta that are possibly from that period.